Do you know someone who would LOVE a Chilis gift card for the holidays? If so, check out this Chilis deal! 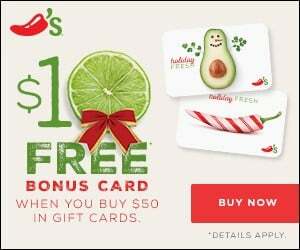 If you spend $50 or more on a Chilis e-gift card, you can get a FREE $10 gift card. 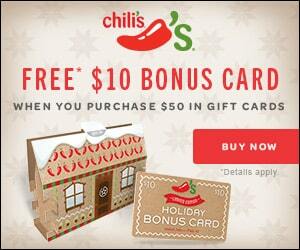 You select the perfect gift card design, print it out, and give the gift of Chilis food!